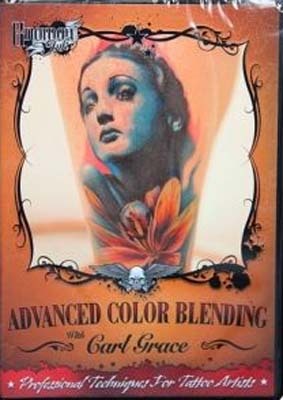 In this DVD, Carl Grace goes from basic to advanced techniques for how to use color in a tattoo. With over four hours of detailed footage and discussion, Carl explains his step-by-step process of applying color to the skin. He introduces warms and cools, different tones and values of color, and how to layer and blend to create a nice, clean piece, as well as how to create focus in your composition. Machine and needle set-up and stencil application are also discussed. Whether you are a seasoned professional looking for new *********s to incorporate color, or a beginner wanting to challenge yourself with color layering and blending techniques, this DVD is the perfect tool to help you learn the correct methods to achieve a painterly, full-color tattoo.